Misty is a great jazz ballad composed by piano player Errol Garner. He first recorded Misty as an isntrumental on his album Contrasts (1955). Later, vocals were added to the song by Johnny Burke. Since then, numerous jazz musicians recorded their own version, such as Joe Pass, Wes Montgomery, Grant Green, George Benson, Larry Coryell, Johnny Mathis, Sarah Vaughan, Ella Fitzgerald, Frank Sinatra, and many more. In this lesson, you will learn how to play Misty’s theme in the form of a chord/melody arrangement. Next, you will analyze the harmony, learn a solo over Misty’s chord changes, and play an arpeggio and chord study. 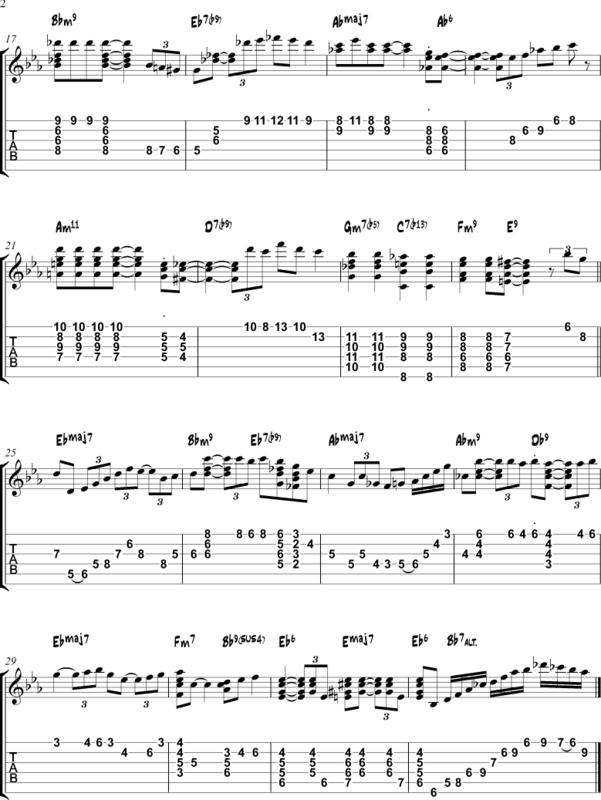 Misty is a lot of fun to play on guitar and ideal to try out new solo ideas because of its tempo and chord changes. Here is a chord melody arrangement of Misty’s theme. I use hybrid picking on this recording. This means I hold a pick between my thumb and index finger and use my other fingers to play chords. I use the pick to play the bass notes of chords, and the melody between chords. I explain some chord choices and substitutions under the sheet music. 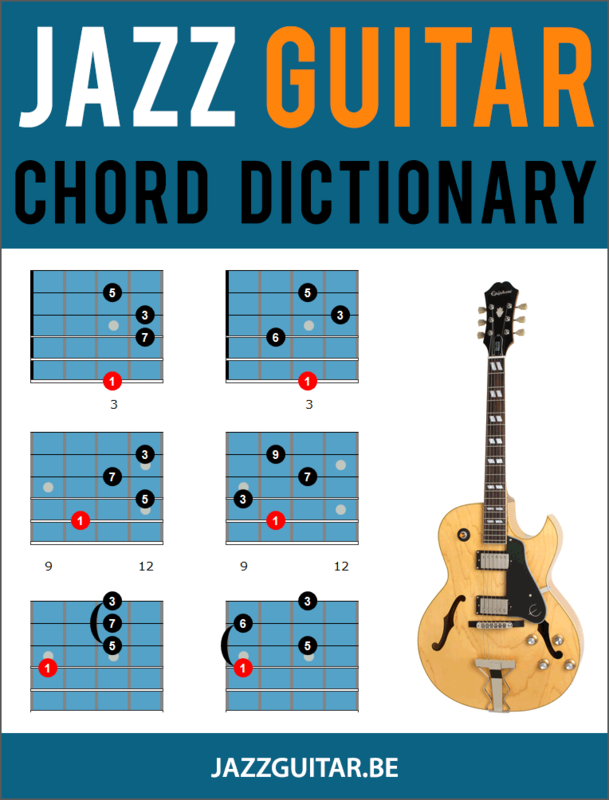 If you’re not sure how to arrange jazz standards in this fashion, check out our eBook The Easy Guide to Chord Melody. 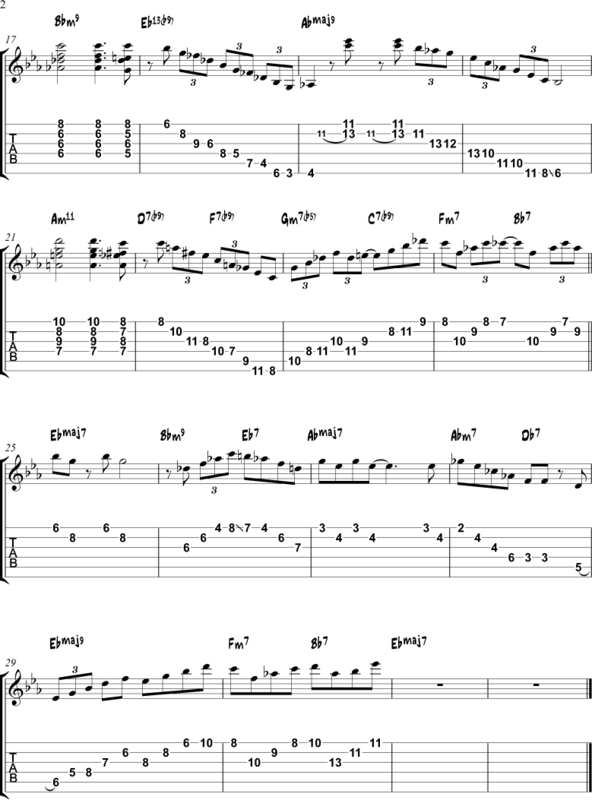 Pickup bar: these 2 chord voicings come from Barney Kessel’s arrangement of Misty. The first one is a Bb7b9, the second one a Bb13b9. Bar 3 & 10: the chord played over the Eb7 is a Gdim7 (=Edim7), a common substitution that gets the b9 into the Eb7. Bar 4: the voice leading on the second beat is a typical movement from the 7 to the 6. Bar 15: here I added an Abm7 (ivm7) chord to delay the resolution to the Eb6 and bring some variation. Bar 17: the voice leading that starts on beat 4 is called a line cliché. Bar 24: instead of playing a Bb7 on beat 3, I use the tritone substitute E7. Bar 31: here I delay the resolution to the Eb6 by playing the bIImaj7 (Emaj7). This is also a common way to end songs. Here’s a sample solo for you to take ideas from to use in your own solos. The text above the guitar tabs explains which scales or arpeggios I use. The number in brackets corresponds with the explanation below the sheet music. (2) Here I play the Bb Dorian mode, a common scale choice on the ii of a 2-5-1. 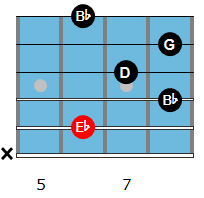 The same scale shape becomes the Eb Mixolydian mode over the Eb7. (4) Here I play the C minor blues scale. C minor is the relative minor of Eb major (the key of Misty), that’s why this scale works so well. (5) An Ebmaj7 arpeggio followed by an Eb major scale. (7) Over the Fm7, I play an F minor pentatonic scale. 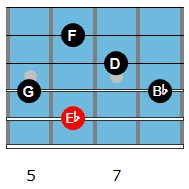 (8) Here, I play an Eb minor blues scale over Eb6. 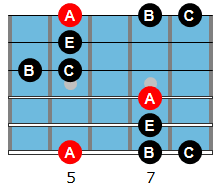 The b3 of the minor blues scale acts as a blue note against the 3 of the Eb6. Below is an harmonic analysis of Misty’s chord changes. Under the chords is the Roman numerals analysis. Above the chords are the scales you can use to improvise over Misty. Misty is usually played in the key of Eb major. The standard is 32 bars long, and has a classic AABA structure: A1 – A2 – B – A2 (the last A is identical to the second A). Bar 1: Misty opens with the tonic chord Ebmaj7 (Misty is in the key of Eb major). Bars 2-3: a ii V in Ab major. You can also view these chords as v7 – I7 going to IVmaj7 (in the key of Eb major). Bar 4: this chord progression is called a backdoor progression or a backdoor ii V. The bVII7 is borrowed from the parallel minor (Eb minor) and resolves to Imaj7. The ivm7 is the ii/bVII7. 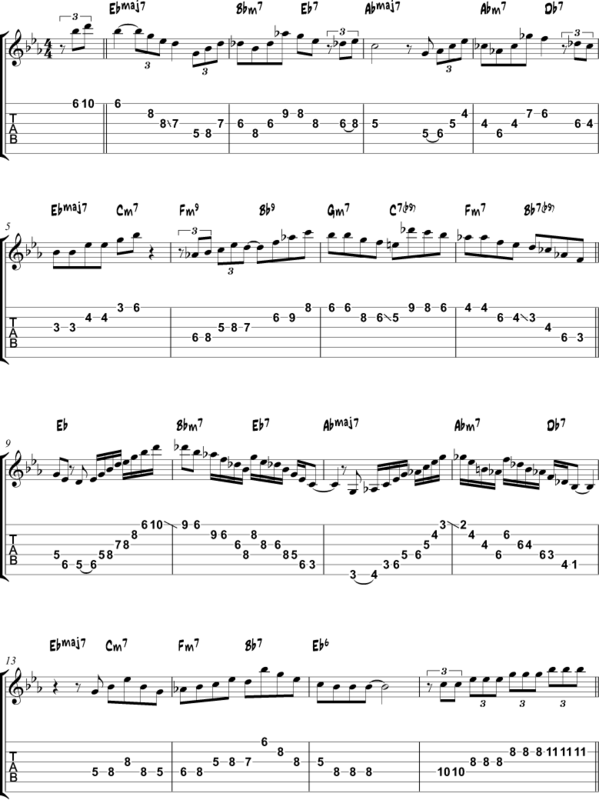 This is a common progression in jazz and is used often in jazz standards. Examples are There Will Never Be Another You, Just Friends, Lady Bird, My Romance, and Cherokee. It is also used in pop music, in songs such as In My Life and If I Fell from the Beatles. The scale of choice here is the Ab melodic minor scale. Playing Ab melodic minor over the Abm7 chord produces an Abm/maj7 sound. 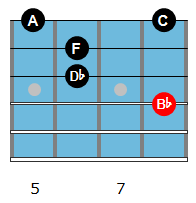 You can also play the more common Ab Dorian scale over the Abm7 chord. Playing Ab melodic minor over Db7 is actually the same as playing the Db Lydian dominant scale. The Db Lydian dominant scale is the 4th mode of the Ab melodic minor scale. Both scales have the same notes but start on a different note. Bars 5-8: most of these chords are diatonic. except for the progression in bar 7 where a circle of fifths turnaround starts. The C7 is the only chord that’s not diatonic. To outline that chord in your solo, you can use an F harmonic minor scale, or play a C7 or Edim7 arpeggio. Bars 9-16: the second A is identical to the first one, except for the last two bars. Here we have the tonic Eb6 to end the second verse, instead of the turnaround of the first verse. A 6-chord is often used to end a section or a standard because it sounds more stable than a maj7 chord. Bars 17-20: the B section starts with a ii V I in Abmaj7 (the IV in the key of Ebmaj7). Going to the IV in a B section is something that happens often in jazz standards. Bars 21-22: an unresolved II V in the key of G major. Bars 23-24: turnaround that goes back to the Imaj7 of the third A. Bars 25-32: the third verse is identical to the second verse. 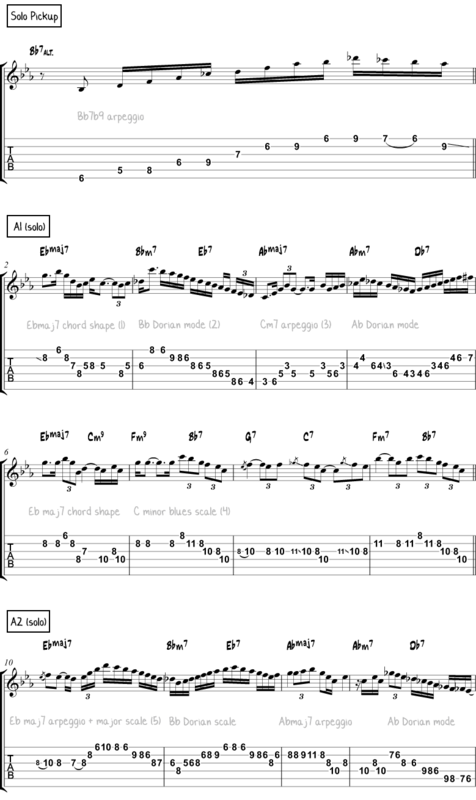 In this section, you will learn to play an arpeggio study over the chord changes of Misty. Arpeggios are ideal to outline the harmony of a song. This makes your improvised solos more interesting to listen to. Only basic arpeggio shapes are used in this study, so no scales or chromatic notes. We often think that playing fast-tempo tunes is though, but very slow tempos can be just as challenging. Because ballads often have more chords in each bar and move into a number of key centers, they pose their own unique challenges. There are a number of variations on the chord changes to Misty. You might normally play a few chords that you see here as dominant 7 chords, instead of minor 7 chords. For example, the Gm7 and Fm7 chords in bars 5 and 6 of the A section. Most Standards have several common ways to comp through the chords, so checking out a few different versions of the tune will prepare you for a jam or gig. Here are the five classic phrases that are used in the chord study below (they are highlighted in the tab/notation). Practice these phrases in a number of keys around the fretboard and apply them to other tunes. This will help you to fully understand and digest these chord lines. A 4th chord, which is built by stacking fourth intervals from the lowest note. A rootless 13th chord, where the root has been removed but the essence of the chord is maintained. In this minor key ii-V-I, you use a common chord substitution over 7alt chords. Here you play a m7b5 chord from the b7 of the underlying chord. This means that for Gm7b5-C7alt you play Gm7b5-Bbm7b5. This outlines the b7-3-b13-b9 of the C7alt chord. In this Ed Bickert inspired phrase, you play a commonly used descending bassline over the Bbm7 chord. You are starting on the 9 (C) as the lowest note of the chord and then move down to the 3rd of Eb7 (G), using both chromatic and diatonic notes. Ed loved to use this type of descending basslines, and it is a great way to add movement in the lower voice of your chords. This phrase comes directly from the Joe Pass playbook. It uses a common chord lick at the start of the phrase that can be found in many of Joe’s classic recordings. The essence of this phrase is that you are playing a drop 2 Bbm7 chord with the 3rd as the highest note. From there, you climb up the scale by playing the 4, 5, and b7 of that chord until you reach a rootless Eb7 chord in the second half of the bar. 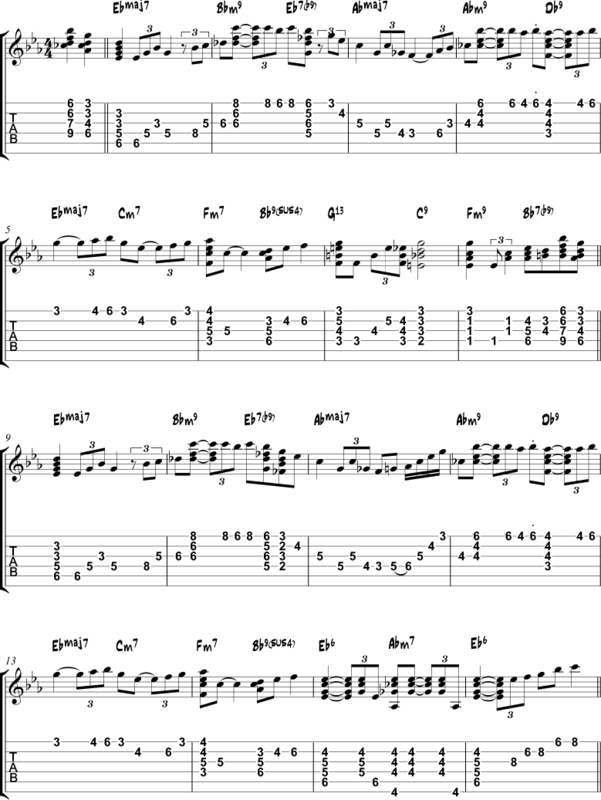 The final chord phrase is also inspired by Joe Pass and features an Abmaj7 chord being used over Fm7. This produces the intervals b3-5-b7-9 over the Fm7 chord. Also, check out the Gb over the Bb7 chord, which is the “blue note” for the key of Eb major. This brings a bluesy vibe to this line as you then resolve it to the major third over the Ebmaj7 chord at the end of the phrase. Here is the full chord study for you to work out and add to your playing. Since Misty is a ballad and played at a slow tempo, you can see there are a lot of chords used in each bar. Because of this, try breaking up the study into smaller, easy to digest chunks, rather than diving into all 32 bars at once. If you have questions or feedback about this lesson, don’t hesitate to post a comment below. Misty is truly a great song, made famous by Johnny Mathis, back in the 50’s when I was a youngster. Every one loved it and it played constantly on the radio pop stations. When the Jazz Artist and R&B singing groups got hold of it, it became a tune that was requested numerous times. Dirk this a good backing piece behind a soloist and/or singer. I’m putting it in my song renditions. Thanks for this one. Thanks again for two wonderful intermediate lessons that I am able to play! “Misty is a sweet little version, and the triad superimposition licks make excellent intro and turnaround licks…I can even use them(forgive me! )in my old time country and Texas swing band! Again, many,many thanks!! A wonderful lesson, can be use as a study on chord soloing. Thanks Dirk. Amazing arrangement !!! Can’t you do more of that for us !!!! Lol !!!! Wow excellent ! Hey Matt and Dirk, thanks a lot for this excellent lesson, Misty has always been a favorite of mine, and I really appreciate the arrangement. Super! This is the best lesson I’ve gotten so far. Smooth and melodic is what I want to lean and you delivered. Please keep lessons of this type rolling in. Thank you very much! Great material for an essential tune. No wonder so many players come here to learn! Misty is a true lounge classic. Nice arrangement. Thanks much! Well, if you don’t know Misty, I suggest Sarah Vaughan’s version. I really love this song and I’m going to study it here. If you’re not familiar with standards, I suggest that you hear Sarah Vaughan, Billie Holiday and ladies ”like” them. Men’s interpretations don’t have the magic that these divas put on the standards. And you absolutely must know standards. 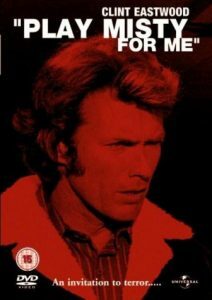 I didn’t ‘understand’ Miles Davis’ version of My Funny Valentine. Of course… He doesn’t play the melody. You must have the melody in your heart, and then hear him playing. Then, once, I saw a Sarah Vaughan’s CD starting with this song and bought it. I listened some 15 times to the song, non-stop, it was unbelievable, so beautiful! And then went to the second song. It was Lover Man. More fifteen times. Then I went to the next. It was Body and Soul. More fifteen times. (More or less, of course). That night changed my approach to jazz. We must know standards, specially from the divas. Jazz musicians started playing over chord changes, without the melody, more or less at the time of Body and Soul (1930). Coleman Hawkins, the sax player, recorded two versions and composed a song on the chord changes. That was the ‘beginning’ of BeBop. I don’t know if he was the first, but it opened a lot of doors. Rainbow Mist. These songs are called “contrafacts”, because they use a well know chord changes, no copy rights to pay, and make their music. So you must know standards for this reason, too. I understand your point. But that’s because you are unexperienced. I was, too, as I told you. Now you have YouTube, search for the song. It’s really beautiful. Imagine how lucky you are to have the internet. You can hear almost any song you want at YouTube. I hope you will love the song. This lesson is very good! My congratulations to the teacher! I know this is going to be quite obtuse, but…I’ve heard people say that modern jazz was invented by George Gershwin in 1927 with all those chromatic Dom 7ths/9ths in “Rhapsody in Blue”. ’27 is WAY way back…It was the first time the piano got out of that kind of rag style that early jazz piano had; the era when the bass drum was basically a big field drum and banjo was king, guitar not in it yet..Then Rhapsody is written. Must of sounded way out, new, modern…the jazzy harmonic language and pace of the big city rhythms..that it possibly spread around, this new orchestral approach. I know it’s a theory, not a proven fact…but quite feasible. Not to take anything away from ol’ George, but everything that was ever expressed in “modern jazz” as well as what could/would be expressed in later periods, i.e. Swing, Be-bop & Cool was done by Louis Armstrong in Chicago in 1925! I just think you do a great work buddy!!! really!, now I want to find the time to put in practice all this wonderful lessons-tip-work you give us!!! from my heart THANKS!! Thanks for another GREAT lesson, my comping has come a long way thanks to this site and your lessons. Love the lesson…very useful and just what I’m looking for, thanks! You are the best out there for cerebral playing. I have enjoyed and learned a lot from all of these comping lessons and continue to find new (to me)chordal and lead line ideas for these kind of jazz chord progressions. Thank you so much for shortening my learning curve in this jazz guitar journey! I love the etude, so much that I immediately bought the ebook, but I just realized the Misty study was not there… Any way to download it other than just printing the web page? Real sweet! No too much coloring. Smooth Jazz at its best! Thanks Dirk. Thanks lot Dirk and the others with the tip. Keep it coming! and congratulations btw for now exceeding the 40k membership. You, Matt and the moderators must be doing it right ! Cheers Alan, thanks for being a member of the forum! That sounds so good….I’d really like to play like that….thanks a lot! Very nice indeed. An arpeggio study that doesn’t sound like an arpeggio study. That’s exactly right! It doesn’t sound like an arpeggio study at all! Great sound Dirk! I just started learning this last week. I was doing the version straight out of the real book. Do you think I should get the original version down first before tackling this one. I’m pretty new at this, really don’t understand substitutions all that well. Hey, if you are just starting out, then maybe learn the melody first, then tackle this study. If you have the melody in your ears it will help hear these chord changes and get this study under your fingers. This is sweet!. How about a lesson on your amp settings to get that sound?! Great stuff…I have taken lessons and I have more instructional materials than the Library of Congress. Finally some good guidance that works for me. 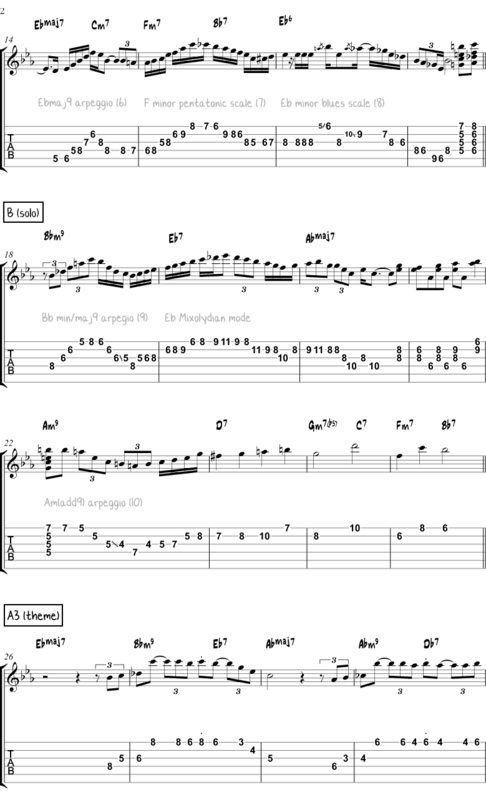 BTW…this Misty study gives me great incentive to work with your arpeggios book. More of the same, please!!!! Man this is amazing! It would be cool to see another one that is one step up in complexity… so we can see how a solo can develop by adding different elements. Then another step up etc. Thanks again though I’m really glad I found this site! Thanks for all the help and inspiration! Hi Dirk , very nice sound . What’s your material ( guitar , amps , effect ) ? Hi André, in this video I use an Epiphone ES-175 through a Fender Hot Rod George Benson amp. The amp is recorded with a Shure SM57 going to Cubase through a Steinberg MR816CSX audio interface with UAD plugins (compression and EQ). Are all the etudes in this book this musical as the example of Misty? I have too many arpeggio etudes that sound like etudes. This is absolutely great. thanks Dirk. I have been slowly working through the Arpeggio ebook, but this came along and I haven’t been able to resist dissecting this completely. The book can wait. I have a question: In measure 17 you play a change on the last chord that is not in the transcription. In that measure you play a Bbm9, and just before the Eb7(b9) arp in measure 18 you hit another chord that sounds so cool. It sounds like a Cm, or maybe G#maj. Am I hearing this correctly? I would love to know what that is. I found this page and I feel great! Thank you very much from Puerto Rico!!! I’m just wondering (being a complete beginner with no music theory background) … is this something you make up on the fly – a nice improvisation – or did you actually practiced and thought that through? Hi Dieter, it’s easy to improvise with arpeggios, but in case of making etudes I use a combination. I improvise a couple of choruses, listen to it, keep the interesting parts and think about how I can make the parts that are not so interesting better from a pedagogic point of view. Thanks for explaining Dirk. So it’s a bit of a mixture. I bought the arpeggio book so hopefully some day improvising with arpeggios will be easy for me too! Related to Misty, is there any possibility to put the arpeggios structure, like used in the ebook, because I found difficult to play the tablature. This is what I was looking for but I just did not Know what to ask for. I’ve learned this so beautiful and chord-rich ballad a long while ago and I can only thank you again for having posted it. Just one more precision about it: is it in the key of Eb Major? or what? Hey, yes this is in Eb major. Matt, what do you mean when you say the song is in Eb major? The main melody is in that key? For instance, if we got to bars 2 – 4, i believe its an IIm7 – V7 – I7maj in Ab maj, and in bar four, i think Im7 – IV7, still in Abmaj. I dont even know if that is possible. Bars five and six seems to me an IIm7 – V7alt – Im7 – IV7 in F minor ( but should be an IIm7b5… ) and so on… How i should look at the standart as a whole and its small progressions? Hope you get my point. Im breaking the song down so it makes more sense thant just plpaying the chords without consciousness of what they are. Thanks for the post!! Hey, the main key is in Eb major. Ab is the IV chord so that section is a ii V to IVmaj7, it’s not switching keys, just highlighting the IVmaj7 chord in that progression. Wow, that’s some real sweet stuff right here, thanks for all of it! Thank you for sharing such a good lesson. awesome. feel as helpless as a kitten up a tree. Is there any typo mistake in the harmony chart when you write Ab melodic minor for the ivm7/bVII7 ? should it be Eb melodic instead ? Hey Pierre, I’ve written a clarification in footnote (4) of the harmonic analysis. Eb melodic minor is not a good option to play over these chords because there’s no Db in that scale. Thank you for your kind lesson ! All the best from Buenos Aires. Great lesson guys… I’ve been playing this tune for over 50 years now and I still love it. I played the melody on my guitar during my first professional gig. I also used to play it on the Hammond M3 during gigs throughout the 60’s, and it’s one of my favorite tunes to play while tinkering on my wife’s baby grand. Thanks so much for this arrangement and backing track. I really look forward to playing it. Matt and Dirk are absolutely first rate musicians and I’d leave them “likes” all day long if I was on social media. I love all their eBooks, and after playing guitar for so many years I still benefit enormously from their lessons. Hello Bill. You may very well have taught me how to play Misty back in ’68! A clarification: in the explanation of the Chord Melody Arrangement, when it puts Bar 29 it must be Bar 31, right? Wow, Wow, Wow! Such a great style of playing and an amazing tone! It is my dream to be able to play like this someday! Thanks guys for the inspiration!! Excellent piece! The chord depth is fantastic. It moved me to look or a youtube version. A Sarah Vaughn video from Sweden filled the bill nicely. There is still a lot that I haven’t begun to touch on, so I’ll be processing this for quite a while. muy buena lección, aun para los que no tenemos conocimientos avanzados de teoria musical, gracias. Muito interessante este estudo. Parabéns. Grato pelas informações. Os arpegios são tão importantes quanto as escalas,. Só agora, percebi a importância de estudar Arpegios com seriedade.